Now on Juicer: User Rights Management. How and When Should You Use It? UPDATE: PLEASE NOTE THAT AS OF APRIL 4, 2018, Instagram no longer allows the posting of comments by third-party apps, so Instagram cannot be used with Juicer's URM tool. Obtaining permission to display or re-purpose social media posts might be a crucial part of your hashtag campaign or contest, depending on what you plan to do with this user-generated content (UGC). 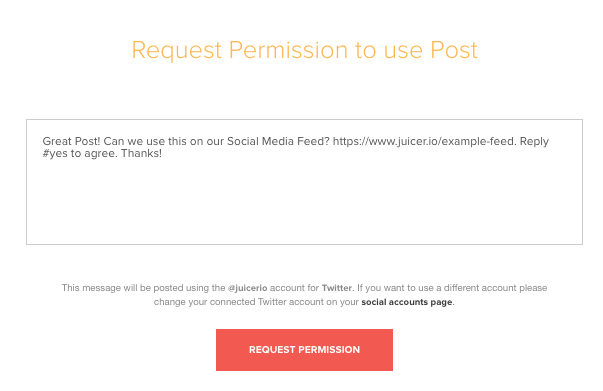 With Juicer’s Enterprise and Campaign plans, you can now request permission directly through our service. Juicer’s URM tool works only with posts that appear in your “Moderated Posts” section, accessible under the “Moderate and Filter” area of the Juicer dashboard. If you plan to use the URM tool, you should enable the “send all posts to moderation” feature. This way, no posts will be displayed in your public feed until you have successfully obtained permission to use them (or if you decide to allow them through yourself). 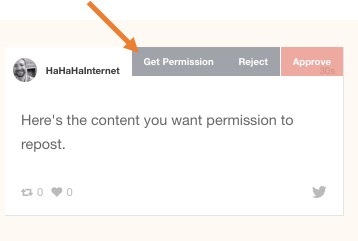 Simply hover over any post in your “Moderated Posts” section, and click the “Get Permission” option. 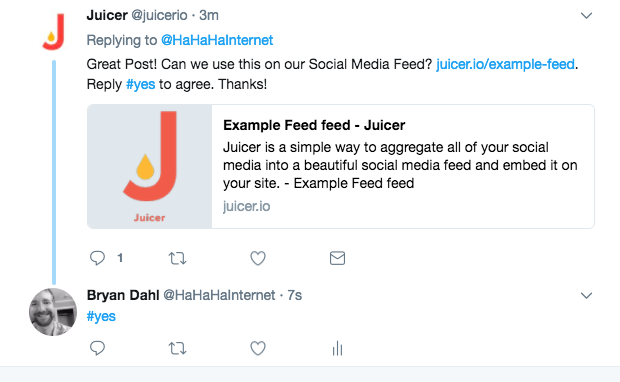 Juicer will prompt you to customize the message that appears to the user who generated the content on the social network. In addition to requesting permission, you may also want to link to any Terms and Conditions you have created for your website or campaign. This message will appear as a comment on the post, coming from the user profile that’s connected to your Juicer account on the “Connected Social Accounts” page. Make sure this account is what you want it to be (probably your main corporate Twitter or Facebook account), prior to requesting permission for a post. Above, for example, you see that the comment came from Juicer's Twitter account. 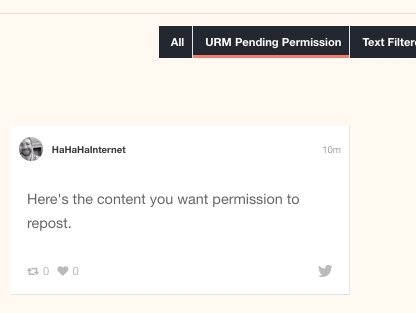 Upon requesting permission for a post, that post will be moved into your “URM Permission Pending” folder, which is one of the buttons you see in the "Moderated Posts" section. If the user responds to your request with #yes, the post will automatically be removed from the Pending folder and placed into your “Public Posts.” No further action is needed on your part. It is still wise to seek legal advice and create Terms and Conditions for any hashtag campaign or contest that you run. The Terms and Conditions serve as an agreement between you and the poster of the content and is independent of any terms with Juicer.io. It is recommended that your Terms and Conditions include certification that the poster has rights to the images/content displayed, and has obtained necessary permission to have ownership rights from any subjects in the photo. These Terms and Conditions could specify the ways you could potentially use the social media content, and provide other necessary legal disclosures and disclaimers. If these Terms and Conditions are readily available to view on your website, then by using your campaign hashtag, a user could be considered to give you implied consent to display their posts. Before you request permission to display a social post, make sure your token connection to that social network is the account you want – you can set this at https://www.juicer.io/social-accounts. The comment asking permission will come from that account. If you are running a hashtag campaign or contest, consulting an attorney and developing Terms and Conditions for participation are strongly encouraged. This will help protect you, and allow participants to understand how their content could be used. Juicer displays social media posts in ways that comply with the social networks’ Terms of Service, and we are an API partner. 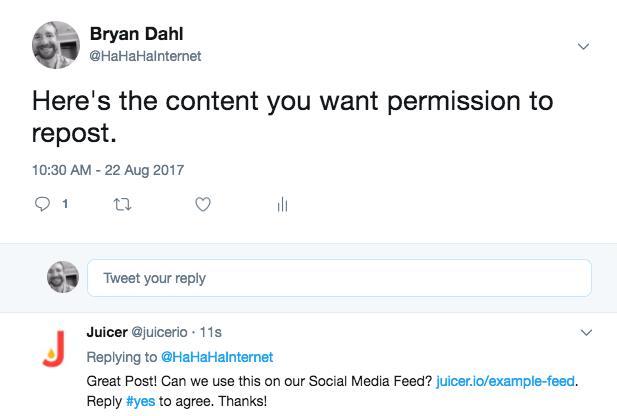 If you plan to display a user’s posts differently at all, Juicer’s UGC permission tool should be used. Please note: Juicer cannot and will not provide legal counsel or advice relating to the use of user-generated content. The blog post above contains recommendations, but nothing in this post or elsewhere on our site is a substitute for consulting a legal expert.